50's vintage handbag with ornate silver, gold and marcasite frame. Navy blue faille. Soft sided fashion bag with gathers at bottom and fitted smoothly into frame. Self handle strap. Graduated gusseting at sides with self piping joining front and sides. Scallop bottom. Lovely sculpted frame with openwork accented with marcasite stones. Navy rayon satin lining with side pockets. 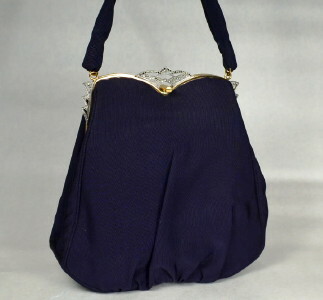 Tasteful handbag with an ornamental frame that makes a marvelous evening accessory. Depth at bottom - 2 1/2"
Excellent condition. Shows fade at very bottom of beautiful lining. Otherwise looks unused.